The rabbits shown below are available for adoption from the shelters and rescue groups that will be attending Adoptapalooza in Union Square Park on Sunday, September 16, 2018. 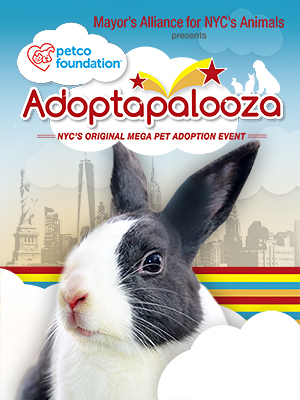 If you see a bunny you'd like to meet at the event, please contact the organization listed on his/her Petfinder profile to find out if he/she will be available at Adoptapalooza. More than 500 dogs, cats, puppies, kittens, and rabbits will be available for adoption from more than 30 New York City area shelters and rescue groups. Confirmed organizations include All About Spay Neuter, Animal Care Centers of NYC (ACC), Animal Haven, The Animal Project, Animal Rescue Fund of the Hamptons (ARF), ASPCA, Best Bullies, Bideawee, Bronx Tails Cat Rescue, Bully Project, Empty Cages Collective, GROWL, Hudson Valley Humane Society, Husky House, Imagine Pet Rescue, Infinite Hope, K9Kastle, KittyKind, Linda's Cat Assistance, Little Wanderers NYC, Long Island Bulldog Rescue, Long Island Greyhound Connection, Louie's Legacy Animal Rescue, Metropolitan Maltese Rescue (MetroMalts), Mr. Bones & Co., NYC Metro Rabbit, The Patricia H. Ladew Foundation, Place for Cats, Posh Pets Rescue, Pound Hounds Res-Q, PupStarz Rescue, Rebound Hounds, Rescue Dogs Rock NYC, Rescuzilla, Sean Casey Animal Rescue, Second Chance Rescue, Waggytail Rescue, and Zani's Furry Friends.